Apple has reduced the price of the original iPad here in the UK, with all models being reduced by £100, ahead of the launch of the iPad 2 which will go on sale in the UK on the 25th of March. 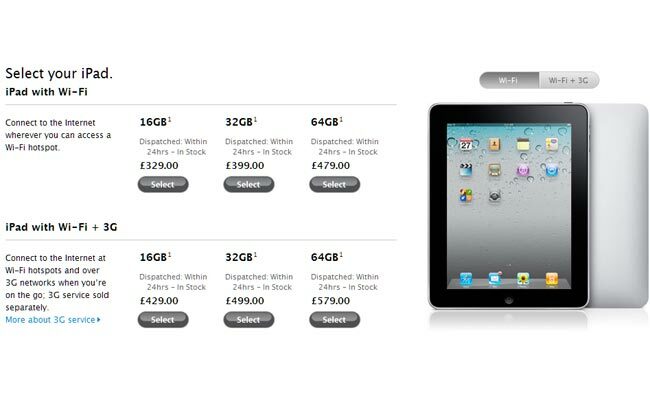 A 16GB WiFi iPad now costs £329, it was previously £429, the 32GB WiFi iPad has now been reduced to £399 and the 64GB WiFi iPad has been reduced to £479. The 3G and WiFi iPads have also been reduced by £100 with the 16GB model retailing for £429, the 32GB model for £499 and the 64GB model for £579. We just checked the Apple store in the UK for refurbished iPads and these are even cheaper with prices starting at just £289 for the 16GB WiFi model.